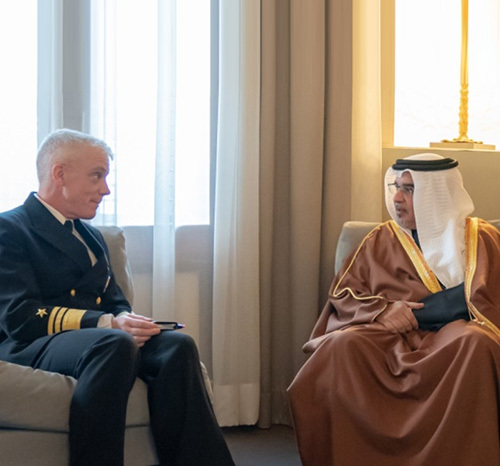 His Royal Highness Prince Salman bin Hamad Al Khalifa, Bahrain’s Crown Prince, Deputy Supreme Commander and First Deputy Prime Minister, received the newly appointed Commander, U.S. 5th Fleet, Combined Maritime Forces, Vice Admiral James J. Malloy, at Riffa Palace in Manama. During the meeting, HRH the Crown Prince highlighted the long-standing ties between Bahrain and the US. In this regard, HRH the Crown Prince underscored the Kingdom’s commitment to further strengthening bilateral cooperation, particularly within military and defense, according to Bahrain News Agency (BNA). HRH the Crown Prince welcomed Vice Admiral Malloy to the Kingdom of Bahrain, wishing him success on his new appointment. The meeting also provided an opportunity to review regional security challenges and areas of mutual interest. Meanwhile, the Commander-in-Chief Field of Bahrain Defense Force (BDF) Marshal Sheikh Khalifa bin Ahmed Al Khalifa y received Lt-General Sheikh Duaij bin Salman Al Khalifa, Secretary-General of the Supreme Council for Defense. The BDF Commander-in-Chief praised the Supreme Defense Council’s efforts.